Most book discoveries—and many of the sales—take place online these days, but how will people find our books? There are four basic ways. 1. They Google you or your book title and find what they’re looking for. In this scenario, readers need to be acquainted with you already. They know who/what they’re looking for, and they know when they’ve found it. While this is a terrific goal, for most of us it simply isn’t reality. If you or I can only sell books to those who currently know our names, our reach is limited. Unless, of course, we’re J. K. Rowling. 2. They see/hear it advertised somewhere. This could be a newspaper ad, a radio interview, a professional review journal (like Romantic Times or Publishers Weekly), or other method. Untargeted advertising can be very expensive. It can reach a lot of people, but the ad tends to be gone tomorrow, covered by something new. And, frankly, many (most?) of the people who see or hear it aren’t interested. 3. They see others talking about it and become intrigued. This is where a lot of online book marketing comes in. We do blog tours, Facebook parties, and Goodreads giveaways to broaden the number of readers who know our names and become interested in our books. What do these three methods have in common? They represent outbound marketing. They involve the author standing on his or her blog, Facebook page, friends’ blogs, newspapers, etc, and shouting OUT about our books. There’s nothing wrong with this. Many fine books have caught on and become best sellers with an outbound marketing approach. If the story has mass appeal and catches the attention of trusted reviewers, it may go viral. Wouldn’t that be awesome? But while outbound marketing is definitely piece of the marketing puzzle, there’s another angle, too. It’s inbound marketing. Think of outbound marketing as a small sign along a busy multi-lane highway. People are rushing by, hurrying on to wherever they’re going, thinking about what’s for dinner or what happened at work. There’s an arrow pointing to the off-ramp noting “good book over there.” The driver/reader in question may not be looking for a good book at the moment. She may have a Kindle full of good books already. More of them stream by every day, so when she actually does want a new one, there will certainly be some available. Inbound marketing focuses on what people are looking for right now, where they are (not where you are) and simply being there, in front of them. To apply the highway metaphor, it’s having a service station right on the interstate where people needing fuel will see it and pull in, rather than in a small town fifty miles down a dirt road, with only a tiny sign pointing to it. Be where people are looking for your kind of fuel. If you want to market to people who do not currently know your name or your book’s title—but who would be interested in your book if they only knew about it—you need to think about inbound marketing. Which brings me to the fourth way people may find your book. 4. They Google “something” and your title comes up. In this case, they’re already actively searching for something. Therefore, if you can pair effective search terms with an available domain name, the URL may be worth snapping it up. This may seem like it would only be effective for nonfiction, but that isn’t necessarily so. I bought http://farmlit.com because farm lit is seen as the next big trend—and because it fits my stories—and because no one else had bought it yet. I didn’t build a full site around it (though I may in the future). I directed the URL to a page on my website where I define farm lit, talk about why my stories fit, and have direct buy links to Amazon for my novel and for other books I feel fit the genre. That’s key, I think. Having a variety of outgoing links helps Google rank a page higher. This page went up in early August 2013. Under two months later, farmlit.com is on the first page of Google results for “farm lit” (currently in the #6 spot). Another link to my page is also on the first page. I’m getting some passive advertising from it and an occasional sale. People who land here are looking for stories about farms. Until they clicked the link, they had no idea who I was or that I had farm lit titles. Now they’ve seen my book. I got the idea for this from a small book called Advanced Book Marketing by E. J. Thornton. She owns the website—wait for it!!—advancedbookmarketing.com. She is an author, marketer, and small publisher with years of experience. If you’re interested in studying inbound marketing, I’d recommend picking up this book and then analyzing the application on her website. If you’re a fiction author, think about what themes or topics people might Google that could lead them to you. You may not want to build a full website around the topic. Instead, the new URL can be automatically routed to yourname.com/books (for example). This can be a low-cost method for snagging quality leads. How can YOU use inbound marketing to help your ideal readers find you? Since my friend Angela Breidenbach and I released a video of us signing a contract for a book we’re writing together, many people have asked how to create something like this for themselves. This post is specifically for Mac users. I’m sure there are similar programs available for use on a PC, but I’m not familiar with them. If you know of something, feel free to leave a comment with the information! Both parties need to have Skype installed on a computer or laptop with a decent webcam. Skype is easy to use and the free version is ample. You’ll need to have each other added as contacts. The person who will create the video and edit it will need Call Recorder, which costs thirty bucks. As far as I know, this is a Mac only program. I’ve used it to record audio-only files for podcasts as well as several videos. The beauty of this program is that it allows for both the interviewer and the interviewee to share/split the screen for the video. If you don’t have high-speed Internet, the quality of the recording will be poor. Mine is iffy. To boost the quality a wee bit more, I rebooted my laptop just before recording and kept only the minimum windows open (ie: Skype and my script!). The “split screen” setting is what gives both parties half the screen in the final video. Remember to look into the webcam while recording. I so wanted to look at Angela’s face, and sometimes I needed to look at my script. But, as much as possible, look at the webcam so people will feel as though you’re speaking directly to them. When you’re done, turn the recording off. It will save to whatever spot you designated in your preferences. I created the closing slides using Powerpoint, then saved those as individual .jpgs and imported them to iPhoto. Then I opened iMovie and fumbled around. I’m definitely not an expert here, but I managed to get the saved Skype video loaded. I edited out some dead space and a few frames at the very end. Then I added the Powerpoint slides to the end and fiddled with the “Ken Burns” effect (I wish the default setting was OFF for that) to keep the slides from zooming in and out—makes me nauseous! At this point I optimized the video (under File) and then exported it (under Share). This gave me the option of saving it to the spot in my laptop where I wanted it. Then I opened YouTube to my channel, hit Upload, and selected the video. Once it is uploaded (speed depends on your connection) you can write the meta-data and tags, add your website, choose which frame to use as the “still” (they only give you 3 options), and set the video to public. From there, you can share to Facebook, Twitter, etc, and pop the link onto your website. I’ve seen a surge in tweets from this site since I added Click-to-Tweet a few weeks ago, making it even easier for visitors to pass on blog posts they find interesting. It takes a few minutes to learn to use the site the first time, and adding the tweetable links to each post also takes a bit of time. However, if you have content you believe others would like to share, why not make it easy for them to do so? Create a blog post and schedule it. Copy the post’s URL as it will look when it is live. Paste it into Hootsuite‘s “add a link” shortener (or some other link shortener) and create a short link. Copy and paste this short link into a document. Create one or more tweets for the blog post that include the short link. Paste one completed tweet into the box. Have fun creating your own click-to-tweets, and watch your content spread more quickly across the Twittersphere. What is a Book Blast? It’s a promotional tool to entice readers to order your book within a specific period of time in order to boost your rankings on (usually) Amazon. Who runs a Book Blast? Anyone can create a promotion like this. It’s particularly suited to authors who can think of a wide range of materials that relate to their story or its theme. Why create a Book Blast? This type of promotion can raise your Amazon ranking. The higher it is, the more visible they make your book to browsing readers. It’s like they notice you. Success breeds success. Some authors’ goal is to hit the New York Times bestseller list. This is a great goal, I’m sure, but not realistic for most debut novelists. However, that doesn’t mean we shouldn’t set goals and work hard to reach them. When should I set up a Book Blast? I chose to create one for 4 days about a week after my book released. This gave enough time for online booksellers to have copies on hand and for me to guest post on enough blogs to help spread the word as widely as possible. You could go as little as one day, and for as long as you wish to. However, the more spread out it is, the less impetus it provides for your fans to BUY NOW and create that push. Where do I set up a Book Blast? If you’re on WordPress, create a special page. Make sure you put password-protection on it. Then create a special email address for this promotion. You can choose to double check each incoming email and send back the link and password, or you can trust your fans and have an auto-responder send the information by return email. If it’s automatic, remember to disable the email address or the autoresponder at the end of the promotion. How do I find material for a Book Blast? I worked with my publisher on this. I requested that they offer a FREE digital download of the novel (buyer’s choice of format) for the purchase of the paperback. They also offered teaser first chapters of other novels in related genres from their publishing house. I sourced everything else myself. I asked several authors I know if they’d be willing to offer first chapters of their books as free downloads. 3 said yes. 1 offered a related short file. Local food is a major theme for my just released novel, Raspberries and Vinegar. I asked my cover artist for a piece of printable “local food” art, and she happily complied. I created a pdf called “101 Ways to Be a Locavore.” I also interviewed 9 people with different perspectives on food and faith (my novel is Christian romance), and created a downloadable podcast from the interviews. 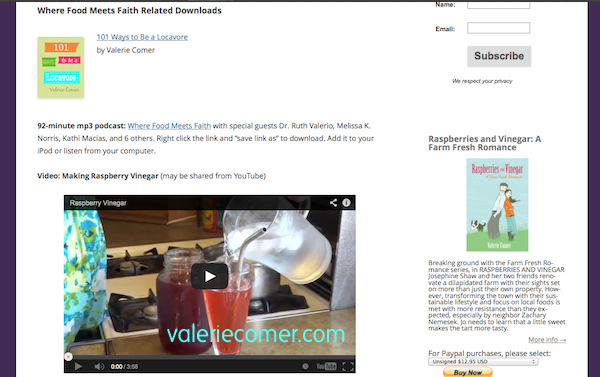 I also had a short video created of the process of making raspberry vinegar, the signature drink in the book. If you’d like to see the promotion in action, my Book Blast is in operation through midnight EST on Friday, August 9. Simply order a paperback copy of Raspberries and Vinegar from Choose NOW Publishing, Amazon.com, or Amazon.ca and see what happens. PS: The Book Blast has been extended through August 15. How could you create a Book Blast suitable for your upcoming release?